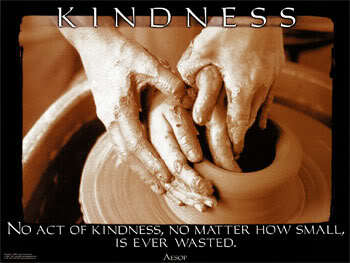 Little acts of kindness may not seem like much, but they can go a long way and have a lasting impact. They bless the recipient and that’s good enough. But sometimes they can become contagious. What you receive, you pass on to others. If others get caught in the acts as well, and they become infected, and the kindness continues … WOW! You could even start an epidemic of kindness. How good would that be?! I don’t watch much so called ‘reality’ television, but there’s something about the acts of kindness shows that tugs at the heartstrings. Sure, they’re more BIG acts of kindness, like doing up the back yard, or changing rooms, or winning the holiday of a lifetime. But how good is it to see people who are down on their luck, getting a treat. To see the tears of joy. To share in the experience. Who do you know who could do with a little act of kindness? Someone doing things a bit tough? A single mum struggling on her own… or dad? Someone recently separated from their spouse? An unemployed friend? A neighbour whose yard has got beyond them? Is there someone you haven’t seen for a while? Perhaps they could do with a call or a visit? Who might appreciate a meal dropped around? Or the kids minded for the afternoon? Or some movie tickets? Maybe your mum has been overwhelmed by all that’s going on and you could pay for a massage for her? Do you know individuals or families who might never get invited out? Why not have them over to your place? Sometimes people’s problems don’t go away. Bereavement and loss. Chronic pain or fatigue. Depression or anxiety. The serious illness, such as cancer. It may seem like there isn’t much we can do. But, let me encourage you to think again. Maybe there’s something you could offer that would just make things a little easier. In fact, it might make all the difference in the world. It could be as simple as popping over for a cup of tea. Maybe you could offer to read the Bible with them or pray for them. If you offer anything, please make sure you follow up on it. Little things show that you are still thinking of them. They indicate that you care. They demonstrate commitment. They’re not hard to do. Little acts of kindness can make a very big impact. I thank God for the little things that people have done for us. For the gifts, the visits, the calls, the practical help, the messages. And the prayers. A little prayer to our awesome God is a kindness of huge proportions. Thank you. I can’t resist sharing this video. I don’t so much like the implication in the song that perhaps the reason to “give a little love” is to “get a little Love of your own” but it shows this contagious nature of acts of kindness (it gets better as it goes along). Thanks to you & Fiona for getting me to have a 19th birthday party when I didn’t want one..
I’m sorry to hear you’ve been unwell. But glad to hear that the tumour has shrunk. I have been married for 15 years to Adam & we have a girl & a boy. He was sick when we we’re only married 2 years…, I can pray for you guys with some insight.